OUSD is testing for lead in consumable water at all of our schools and remediating issues as they are identified. While our facilities are generally well-maintained, the average age of our buildings is 57 years old. It is important that we test to ensure the health and safety of our students and staff. Our efforts to test for and address elevated lead levels, and inform families and staff are ongoing. The elevated lead readings found at some school sites were not school-wide, but found at one or two isolated faucets or fountains. School leaders were notified of the issue by the Buildings and Grounds Department and/or Risk Management and the indicated water sources were immediately taken out of service and have been replaced or are in the process of being replaced. We are committed to transparency about this testing. It is our top priority to provide a safe, healthy environment for students and staff. On Feb 28, 2018 the Board of Education adopted Board Policy 3511.3 Clean Drinking Water. This policy requires the district to replace or remediate sources of consumable water that contain lead levels higher than 5 ppb. Previously, the district had been adhering to the Environmental Protection Agency (EPA) recommended action level of 15 ppb. EBMUD testing at all district-run K-12 school sites continues. OUSD completed testing at charter-run schools located at district facilities. OUSD completed testing at all district-run school sites and child development centers. OUSD testing at charter-run schools located at district facilities continues. OUSD began testing the water quality at charter-run schools located at district facilities. EBMUD started testing the water quality at all district-run K-12 school sites. OUSD began partnering with EBMUD, our local administrator for the State Water Resources Control Board program to provide free testing to school districts. 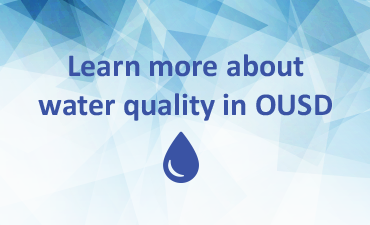 OUSD began proactively testing the water quality at all district-run school sites and child development centers. OUSD inquired about district-wide water quality testing through a state-funded program administered by East Bay MUD (EBMUD). The Environmental Protection Agency (EPA) sets an action level of 15 parts per billion (ppb) for lead in drinking water. Higher than 15 ppb: The corresponding drinking water outlet should be re-tested to confirm the initial result. Upon confirmation of the initial result, the drinking water outlet should be either addressed to mitigate the lead problem or permanently removed from service. Any corrective actions implemented by the school for that drinking water outlet should be re-tested to confirm the lead level in water is not higher than the action level. Not higher than 15 ppb There is a strong indication of insignificant exposure to lead at that particular sample location and the corresponding drinking water outlet can be returned to use with no further water testing. Questions? Contact your school principal or the Risk Management Office. These are working documents and are updated as test results become available. We are also in the process of adding further test results per Board Policy, Feb 28, 2018. This document will not be updated. Please use the more current and comprehensive information above.